Senior fire officers inappropriately claimed items on company credit cards and failed to declare gifts and hospitality, a report has found. 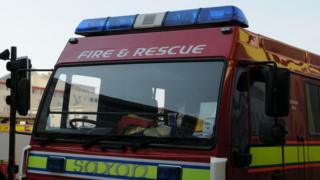 The internal audit looked at policies and procedures within Gloucestershire Fire and Rescue Service following a number of whistleblower complaints. Auditors said failure to record these could result in allegations of bribery. Gloucestershire County Council, which runs the service, said it recognised certain policies were not followed. A spokesman added it would "make sure previous poor practices are not repeated in the future". The audit report, which will be discussed by the Audit and Governance Committee, has a list of actions set to be taken, which include a code of conduct for staff. Some of the actions will mean reviewing expense claims for business mileage, fuel card use and meal expenditure. The audit was commissioned following a number of complaints about how the fire service was run, and comes after the resignation of chief fire officer Stewart Edgar last year over the sale of a Land Rover. At the time, an internal investigation found Mr Edgar demonstrated "poor judgement" over the fire service vehicle's disposal. In the most recent case, auditors found company credit cards had been inappropriately used. It highlighted cases where card holders had shared PIN information with others, single transactions limits had been circumvented by splitting the payment into two transactions, and that some expenditure "may not be all for legitimate business purposes". Auditors also found gifts and hospitality accepted by senior officers had not been declared - including trips to Australia, America and Scotland. It found there was "a lack of clarity" around the rules to be followed when offers of gifts and hospitality were received. Referring to undeclared gifts, the report said: "Omissions of this nature could result in allegations suggesting perceived inappropriate staff behaviour, bribery and corruption, lack of transparency in respect of business decision making and not obtaining value for money."